Supply 11*10/100/1000Mpbs adaptive high speed forwarding data packet non-lost port. Support IEEE802.3x flow control for Full-duplex mode and backpressure for Half-duplex mode. Each port max. power supply reached 30W. Network Medium: 10/100BASE-TX:5 class and above non shielded twisted pair. POE Protocol: IEEE 802.3af/IEEE 802.3at. [Port and rate] The Switch includes 8 POE ports ,2 UpLink port and 1 SFP port, all ports up to 10/100/1000Mbps speed and data distance up to 100m in normal mode. [120W Power Supply Internal] Support IEEE 802.3af/at. Max 120W(52V 2.3A) power built-in, each port max power supply reached 30W and can support 8 ports each 15.4W in the same time. [Unmanaged Switch] Power Detection ports automatically detect devices. All ports supported by MDI/MDIX auto flip and self negotiation. Plug and Play, just plug in the power cord and network cable, no configuration required, easy to use. [250m and VLAN support] When the extend mode is enabled, single POE port supports 250m transmission distances and 100Mbps speed. 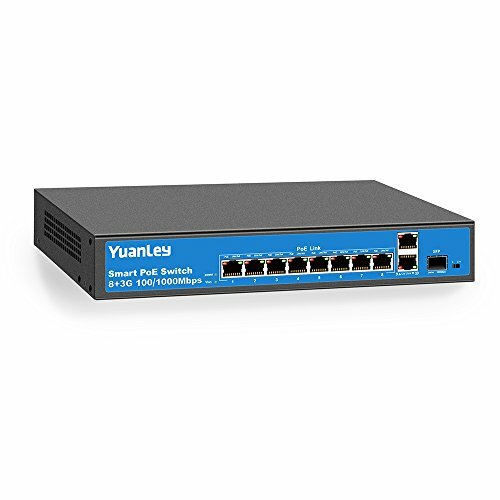 1-8 ports support VLAN isolation, improve the network safety. [Wide Applications] Built-in power supply. Compact design. Durable Metal. Bilateral heat dissipation. LED activity indicator lights. Widely used in IP cameras, Wireless Access Point, IP Phone and Computer Networks devices. 100% Satisfaction Guarantee - 30-day Money-Back Guarantee with 1 Year Warranty. If you have any questions about this product by YuanLey, contact us by completing and submitting the form below. If you are looking for a specif part number, please include it with your message.